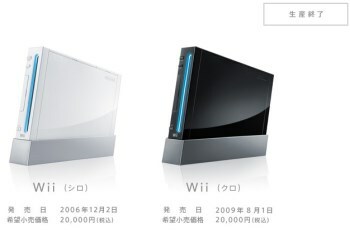 Nintendo has very quietly revealed that the venerable Wii is no longer being made. Just a few weeks after Nintendo announced that production of the Wii would "end soon," the axe has fallen - and the end has come not with a bang or even a whimper, but just a tiny little notice in the upper right corner of the Wii website. Kotaku says the message translates into "production ended," while Engadget puts it at a slightly more succinct "discontinued," but the bottom line is the same: the once-mighty Wii is finished for good. The Wii had a good run, and although it may have never earned the respect of "real" gamers, it sold more than 100 million units after launching in 2006 and at one time struck fear into the hearts of both Sony and Microsoft. Give that its successor, the Wii U, hasn't managed to even approach that level of success and, with all due respect, probably never will, it really is the end of an era.